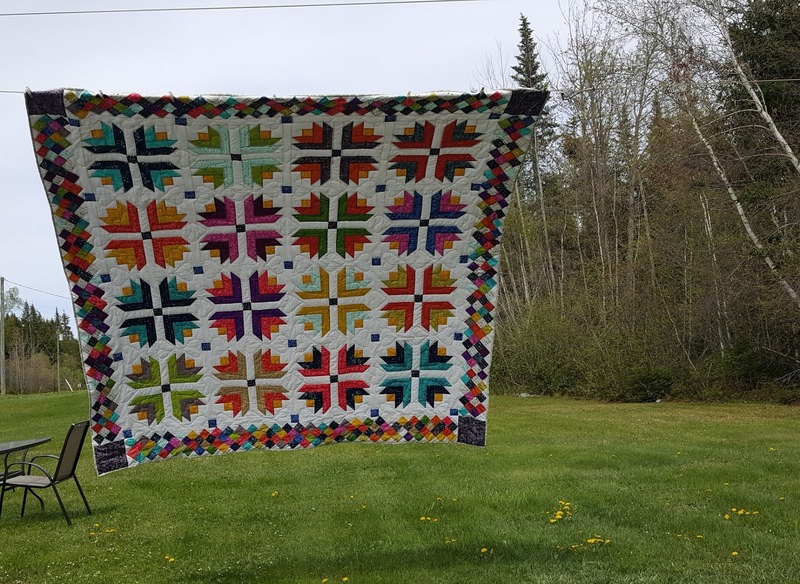 I am pleased to announce that I have another quilt tutorial being released on the Modabakeshop. 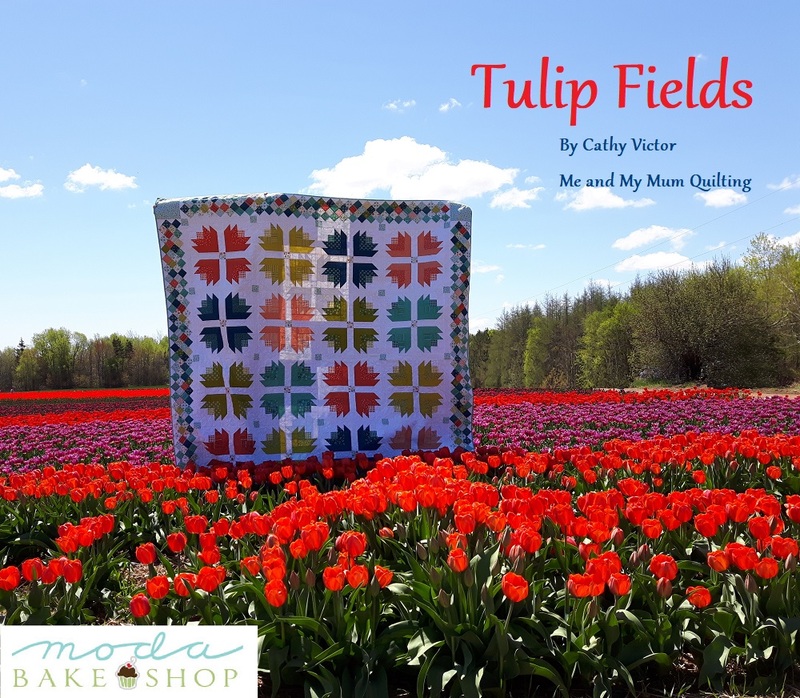 "Tulip Fields" is a quilt inspired by the stunning Vanco Tulip fields, located here in Prince Edward Island, Canada. My version uses the lovely "Well Said" fabric collection by Sandy Gervais. I also pieced the quilt backing using the "Well Said" panel available for this collection. My Mum's version using "Sun Prints" Collection by Alison Glass, is super bright and fun using a scrappier approach to making the tulip blocks. I wanted the backing to be 4" larger all the way around. Because I had regular yardage each full side piece measures 41" wide. Doubled = 82". If I want 104" in width I need a section in the middle that measures 22" finished. I was able to make 2 extra 18" tulip blocks. I added 2 1/2" strips to all 4 sides of the blocks to yield a 22 1/2" x 22 1/2" square. From the panel cut (4) squares 10 1/2" x 10 1/2". From the Background fabric cut out (4) 12 1/2" x 10 1/2" pieces that will placed to the right or left of the panel squares, according to the layout. From the background cut out (5) 2 1/2" x 22 1/2" strips to add between the large blocks and panel pieces. Lastly cut out (2) 5" x 22 1/2" strips to add to the top and bottom of the pieced portion of the backing. 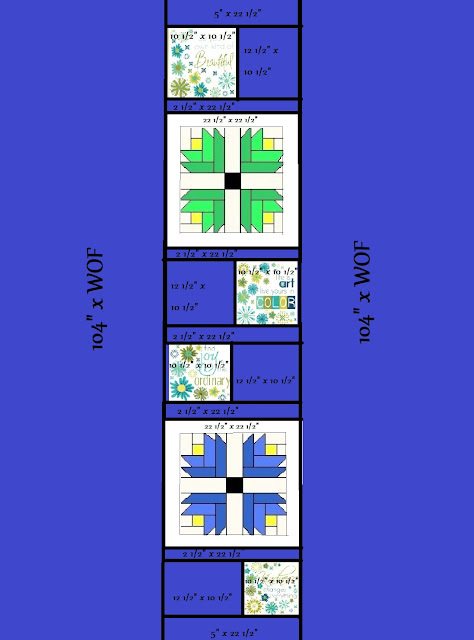 Sew the pieced portion between (2) 104" x 41 1/2"(WOF) lengths to complete your pieced backing. Really like the pieced backing. Great diagram, which I will be using as soon as possible.